Do you need expert opinions on the Russian marketplace? Do you want to reach out to other businesses in Russia? Do you want to network or expand overseas? Then this list from Bookyourdata.com has what you need: Russian emails, phone numbers, addresses, and much more! Let the people of Russia know about your product or services with the help of this accurate, reliable lead list. It has the information you need and is ready for you to download right away! This list is full of the top business-to-business (B2B) connections and contains the names, emails, and all of the contact information you need to conduct a more effective marketing campaign. Connect with Russian businesspeople easily with the help of this contact directory. This is one of Bookyourdata.com's human-verified and ready-made products. That means that it's ready to download right away. It can be pulled into your CRM easily as an .xlsx or .csv file; unlike our competitors, we give you the data without charging you extra, hidden fees. Today, within minutes, you can start connecting with Russian contacts via mail, email, or phone. Whether you intend to boost your sales in Russia, find manufacturers or important company contacts, or simply network with a new group that is very familiar with the marketplace, this list can help. 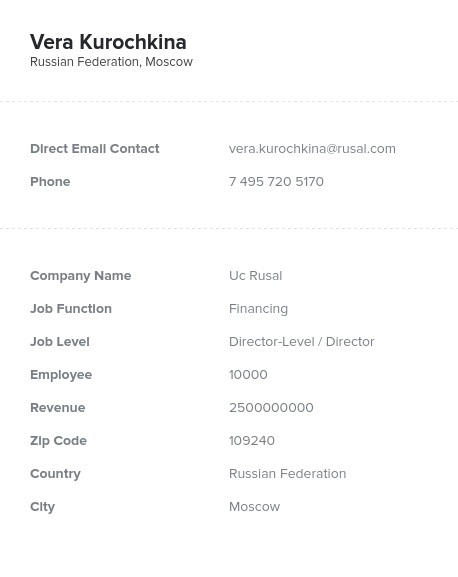 Bookyourdata.com is all about forging connections between great businesses, and this Russian email list can help you do that even on the other side of the world. Pull this data and market to Russian businesspeople today!